Del Sol is a clothing brand that loves the sun as much as the people who wear their shirts and other apparel do. And, it certainly shows – with shirt designs changing in cool ways in the sunlight, reverting back to their original artwork when the wearer returns indoors. Whether you're on vacation, at the beach or just playing in your backyard, these color-changing products are a sure-way to brighten your day. Del Sol is a clothing brand that loves the sun as much as the people who wear their shirts and other apparel do. And, it certainly shows – with shirt designs changing in cool ways in the sunlight, reverting back to their original artwork when the wearer returns indoors. In exciting news, the line of shirts recently expanded and fans couldn't be happier with the news. When it comes to positive energy and healthy fun, there's something about being out in the sun that's near impossible to beat – especially if it's at a sunny beach. Innovative clothing brand Del Sol certainly agrees, being the leaders in apparel that changes color in the sun, something that makes for a very fun and creative conversation piece that actually does involve the weather. In good news, the already impressive Del Sol catalog recently grew in very cool ways – with a number of new, sure to be popular, vacation and beachwear shirt designs being added to the collection – and they all change colors when out in the sun. According to Del Sol, some highlights of the additions to their online catalog include: Men's Surf Sketch Classic Tee; Girl's Hibiscus Turtles Beach Cover-Up; Girl's Wild ‘n Free Jersey Tank; Men's Mighty Marlin Jersey Tank; Kid's Mako Shark Crew Tee; and many more. Beyond high quality and very cool color-changing T-shirts, Del Sol also carry lifetime-guaranteed polarized sunglasses, all kinds of beach and outdoor accessories, and very popular nail polish, nail care products and nail decals in the “out in the sun” spirit. All Del Sol's catalog shares a commitment to quality and keeping prices attractive and are supported by a knowledgeable, dedicated customer service team and a lifetime color-change guarantee. Del Sol is happy to offer free U.S. shipping on all orders over $35. Reviews and feedback continue to be positive across the board. Del Sol first splashed onto the retail scene in 1994 out of a small cart in Murray, Utah’s Fashion Place Mall and has been sticking its color-changing clothing and accessories where the sun shines ever since. 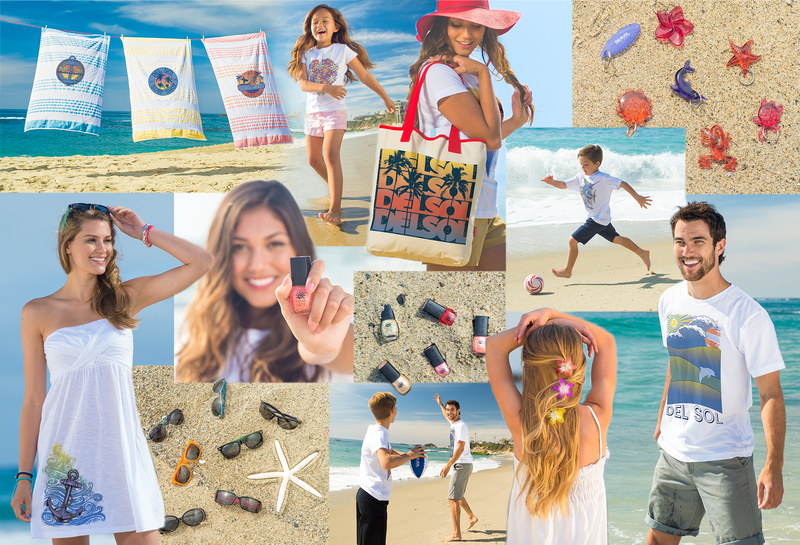 Today, Del Sol has grown to more than 100 store locations worldwide in 28 countries, is the world’s leading brand of color-changing apparel and accessories, and one of the most highly promoted merchants onboard Royal Caribbean, Carnival, Princess, Disney, Celebrity, and Norwegian Cruise Lines.